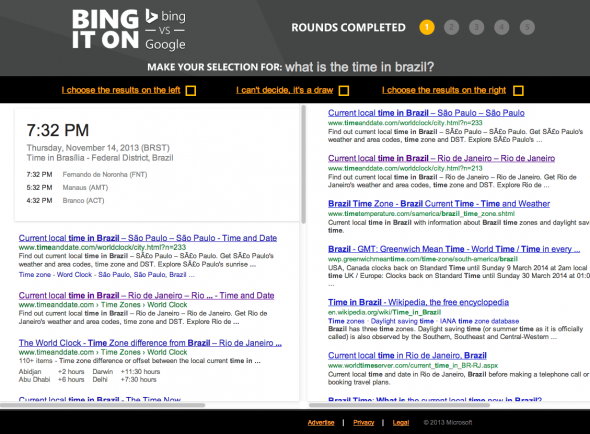 Has Bing overtaken Google as the king of search? Whilst some argue that the end of search engines is nigh with some kind of paradigm change due in the near future, Google has continued to dominate the search space–practically peerless–for a number of years. 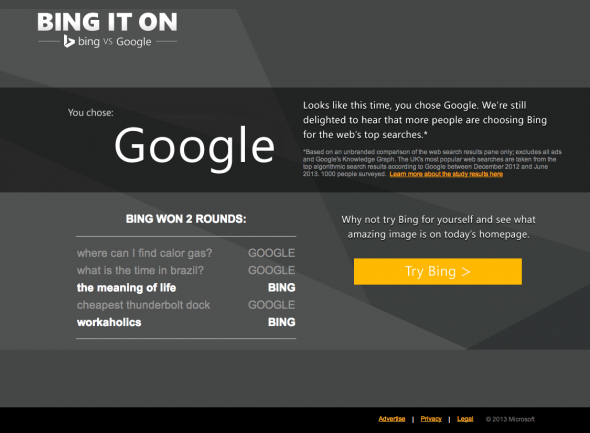 However, Bing has thrown down the gauntlet with the launch of its “BING IT ON” campaign that asks users to run 5 searches head-to-head in a (sort of) blind test, which then reveals the winner. 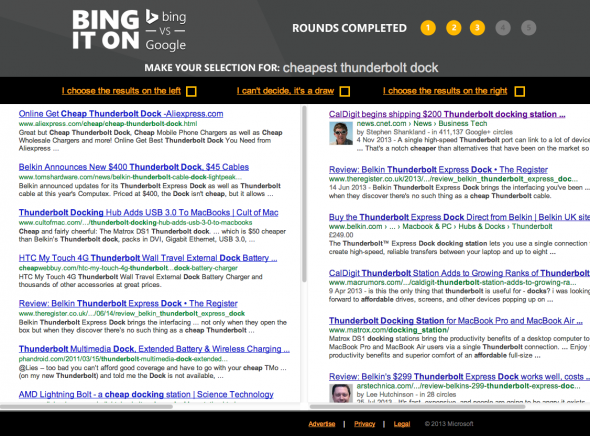 It’s a clever yet bold move from Microsoft, but how did it fair in the 5 searches I tried? As you can see demonstrated here, Google appears to be winning on long-tail search terms and the phrasing of the query in question form has clearly had an impact with a combination of Google’s Knowledge Graph and perhaps even Hummingbird’s targeting of question phrasing, adding relevance to the equation. 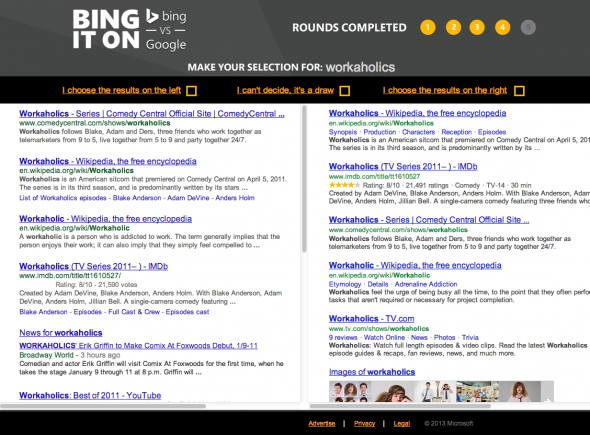 The mixed bag searches were far broader and it would appear that for my searches at least, Bing edged out a win. 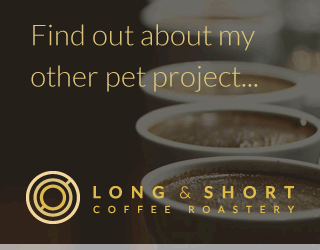 It’s certainly worth keeping an eye on both search engines and switching between the two for your general searches to see which turns up more relevant results. 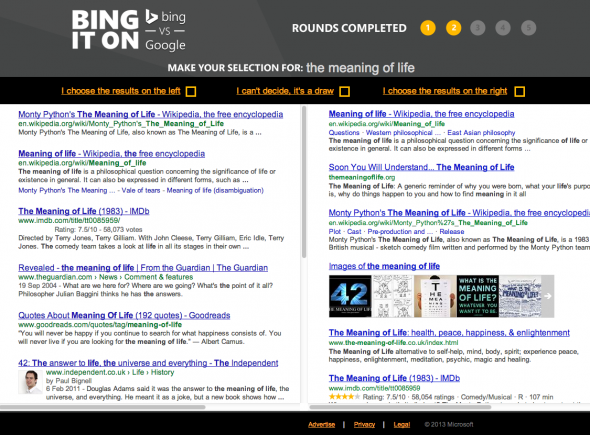 I’ve had several instances recently where Google would not return results that I wanted, so having the option of Bing is really quite good news for the world. 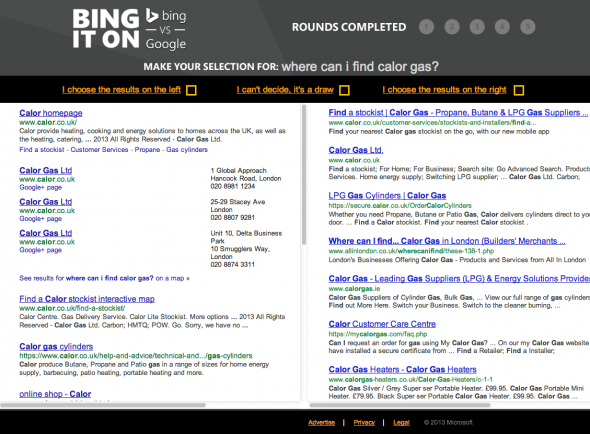 For marketing professionals, Bing still represents a cheaper alternative to Google’s Adwords as far as PPC campaigns go and although there is less inventory, this avenue really shouldn’t be ignored. And for SEO professionals, the event of Bing stealing market-share from Google should appease some concerns of recent years with Google’s increasing power (the removal of keyword data in Google Analytics and the advancement of on-page widgets to keep the user glued to their own assets like Google Images and movie listings, for example) by offering diversification in organic traffic sources. Until we enter a new era, post-search, we can only hope that more players in the search space (check out the search engine that plants trees) can challenge Google’s monopoly and promote a competitive environment that allows smaller businesses to thrive. 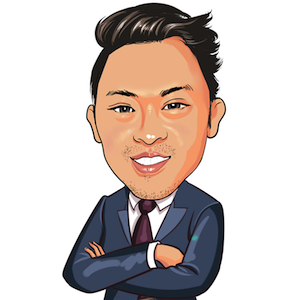 I use this blog of mine as a general brain-dump and to share my witterings about marketing, business, search engine optimisation and web development. Sign up to receive all the latest posts - it's free and will only update you with the latest and greatest.